Today I have two wedding cards done for Splitcoaststampers Challenges. 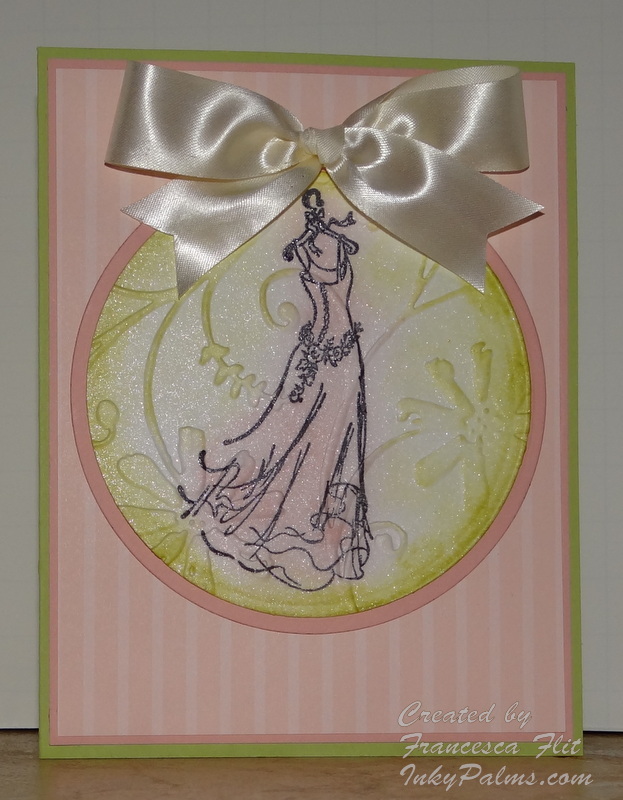 The first one was case’d from this lovely card Wedding Snow Globe by Angela Maine. This card just does not photograph well, it is much prettier in real life. It has the same shimmer as the second card and is mounted on a Stampin’ Up! Shimmer White card base, I guess it doesn’t show up well because of all the white. 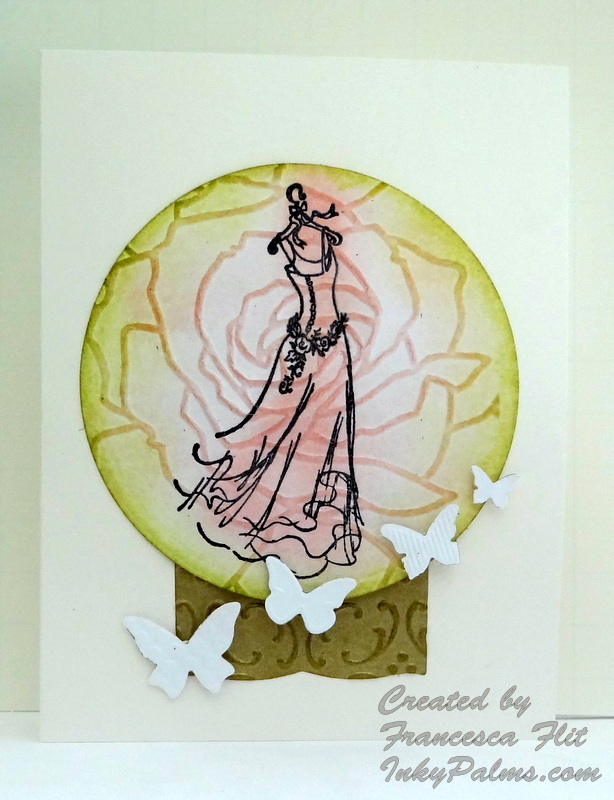 For both cards, I stamped and embossed the PSX Gown stamp and then die cut with a Nestabilities Circle die. I sponged the image with Blushing Bride and Certainly Celery and then sprayed with glimmer mist I made using Stampin’ Up! White Frost Paint. 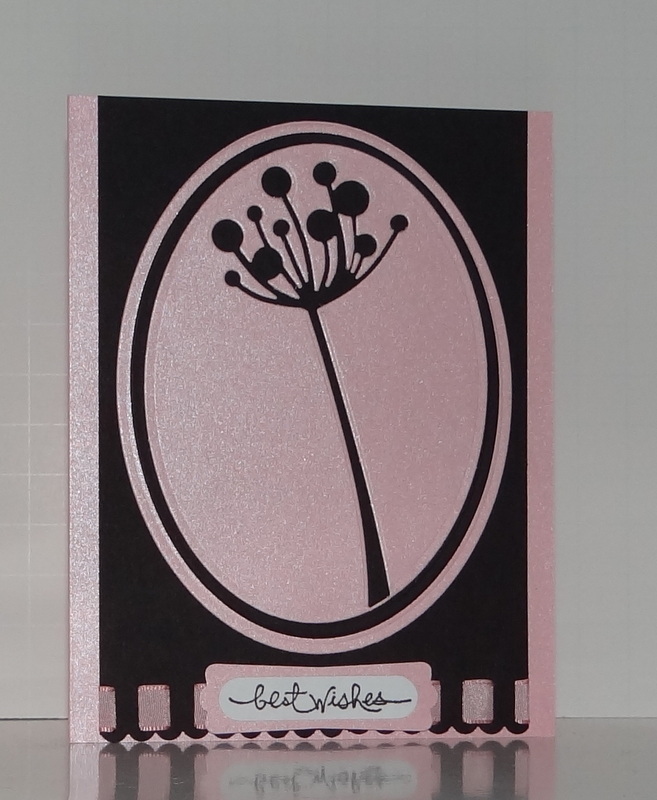 When it was dry, I embossed the first card with Stampin’ Up! Manhattan Rose Embossing Folder and the second with a Cuttlebug embossing folder. I lightly sponged over the rose embossing with Blushing Bride to add a little more definition. For the base of the snow globe, I cut a piece of Stampin’ Up! Gold Cardstock with a Nestabilities die and embossed with a Stampin’ Up! embossing folder. I sponged a bit of Encore Gold Ink on the base and mounted the snow globe on a Stampin’ Up! Shimmery White card base. I used a Stampin’ Up! Embosslits to cut the butterflies and mounted them with Stampin’ Up! Dimensionals. For the second card, I matted the sponged the image with Blushing Bride and Certainly Celery. I used a piece of Blushing Bride Print Pack paper for the background, matted it in Blushing Bride and mounted on a Certainly Celery card base. I tied a bow with a piece of off white ribbon and mounted it with glue dots. I did not put the sentiment on the front because the stamp I want to use is on order. Another relatively quick card today using the Honeycomb Shapes technique. We have a friend who just got engaged while vacationing in France and I wanted to make a card with a nod to their experience in France, but not over the top French themed. 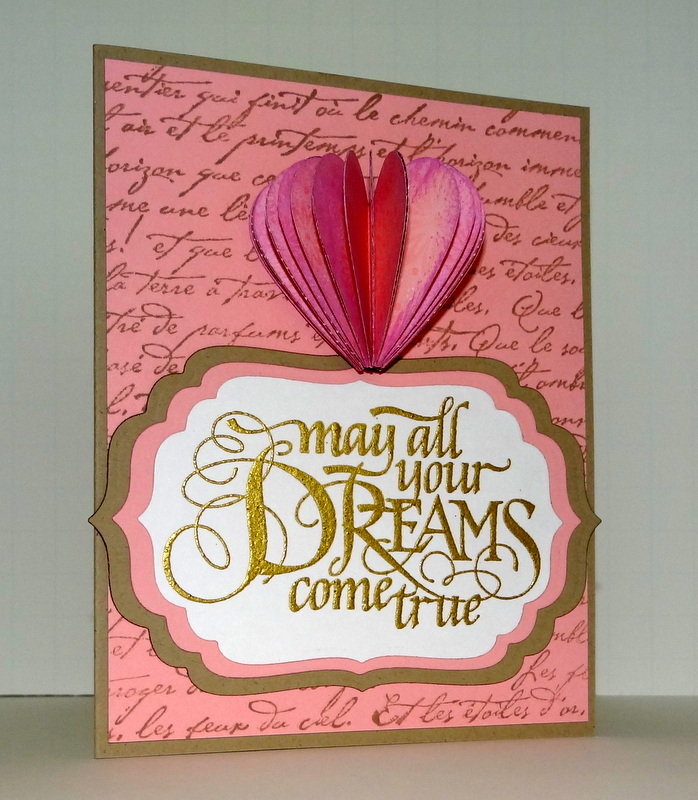 I decided to use Stampin’ Up French Script stamped in Crumb Cake on Pretty in Pink for the background. I mounted that on a Kraft card base. I stamped and embossed the PSX sentiment in gold and used Nestabilites Labels Four to cut the sentiment and mats. I punched 21 hearts out of pink patterned paper with the Stampin’ Up! Heart punch and used a chalk ink cat eye to ink the edges. I creased and glued them together and mounted on the card to add a little whimsy.